Romeo and Juliet is one of William Shakespeare’s most well-known and culturally referenced plays. The tale tends to be spun as a romance, but all who have stayed on for the final act know that the story ends in tragedy. The two lovers are torn apart by rival families, distance, and even death. In Canada’s Ballet Jorgen‘s production at the Betty Oliphant Theatre, Romeo and Juliet are given a new obstacle in the production: silence. William Shakespeare is without a doubt a wordsmith. His grand odes to love and soliloquies of pain are meant to sway the hearts of audiences. In ballet, there is no shouting or crying. The dancers speak with their bodies, floating across the stage in a whisper and leaping into the air for shouts of joy. The dancers convey all the emotion of words through Bengt Jorgen’s inspiring choreography. Romeo and Juliet start their relationship with excitement. They begin with a moonlit dance, where every step is a flirtation. Every look buzzes with excitement as they twirl and twist on stage. With the growth of their love, the choreography changes. The dances are similar, but they are defined by the context of their relationship. They dance for excitement, for love and inevitably for loss. In the famous balcony scene, Romeo woos Juliet with his promises of grand affection. Again, how to show a vow of love without a voice? They sweep across the stage in long graceful moves, transforming the childish infatuation into something deeper. Romeo lifts Juliet into the air and her nightgown flutters softly. As they move together, gazing into each others eyes, you can feel them fall in love. The last dance between lovers is both clever and heart-breaking. In Shakespeare’s play, Romeo discovers that Juliet is dead and visits the crypt of her household. Romeo finds Juliet’s suitor Paris in front of the crypt and kills him, then finds Juliet lying supposedly dead inside. Romeo vows to die with Juliet and poisons himself. Juliet then wakes up, sees her Romeo has tragically killed himself and stabs herself with his dagger. While the play’s end is gut-wrenching and filled with blunt violence, the ballet has a more subtle interpretation. In a twisted mirror-image of their loving dance in the moonlight, Romeo picks up Juliet from the crypt and dances with her body. Juliet remains limp as Romeo tries to recreate the moment they once had. The scene is a testament to the talents of Hiroto Saito as Romeo and Saniya Abilmajineva as Juliet, who make the movements seem real and surreal. 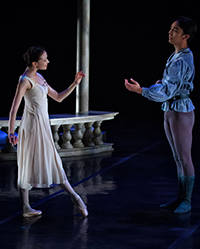 The dance shows the grief and pain of Romeo, having lost something so quickly. This scene is also a clever way to drive the irony of the situation that Juliet is alive, but will never know she had this last dance with her husband. Instead of using the brutality of poison and a dagger, the lovers simply die as if the loss of love is enough to stop the heart. They cannot live with and without each other. After five years of studying English Literature, I have had to read Romeo and Juliet. I have watched productions of the play in classrooms, theatres, and even in Toronto’s beautiful High Park while sitting on the grass. I have watched films by Baz Luhrmann and Franco Zeffirelli. I thought I had seen every possible way to tell the tragic story of young love, but I had forgotten one thing: I had never seen Romeo and Juliet danced. The production by Canada’s Ballet Jorgen woke me up to that mistake. Tickets: Premium seat tickets are $76. Regular are $56 adult and $47 senior. Discount tickets are $36 for adult and $30 student and senior. Seats are reserved. Order online or by calling UofTTix at (416) 978-8849. Photo of Saniya Abilmajineva and Hiroto Saito taken from Ballet Jorgen Canada’s Facebook page.